I know, I know I should have been doing my dissertation, but I’d already gone for a late lunch with a good friend of mine so was not going to realistically go home and do work now was I. So to the poetry slam I went. Except this week was different… there were not that very many people there so it was decided that instead a poetry workshop take place. I’ve been wanting to write about my experience of touching the stone walls in the Temple of Karnak for well over a year but every time I sat down to do so I just couldn’t. I couldn’t articulate what it truly meant to me. But this workshop helped me to FINALLY put pen to paper and just write. It was a super interesting and creativity challenging workshop taken from a spoken word artist Hollie McNish. The layout being to write from the first things that comes from your head, to not censure yourself at all following a set of 6 prompts. 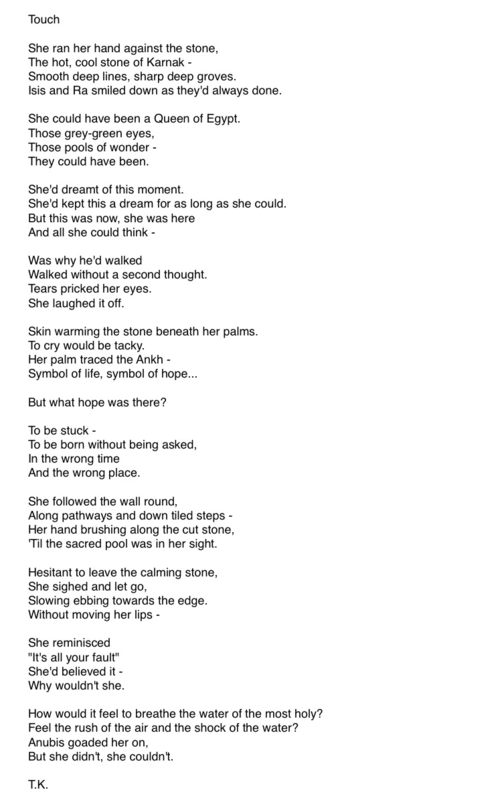 Once you had those 6 prompts written down it was simply a matter of somehow making them fit into a poem… and from that I finally managed to write a poem I was happy with. The only thing I’d like to change is the title but the title is not important in this case, so I’m happy to leave it for as Touch for now.